We’ve reached the back-half of October, which means that even in an ordinary election season, we’d be milling out of the proverbial stands, ready to be done with all of this campaign nonsense. But we’re not in an ordinary election season: We’re trapped in a genital-groping, spray-tanned fugue state, where everyone from Crooked Hillary Clinton to Crooked The Onion is conspiring to blockade a baby-fingered jack-o’-lantern from fulfilling his presidential birthright. So naturally, this level of insanity means we are now fully engaged in debating the voting inclinations of fictional characters, including assertions over whom would earn the vote of the luxuriously mustachioed Ron Swanson. 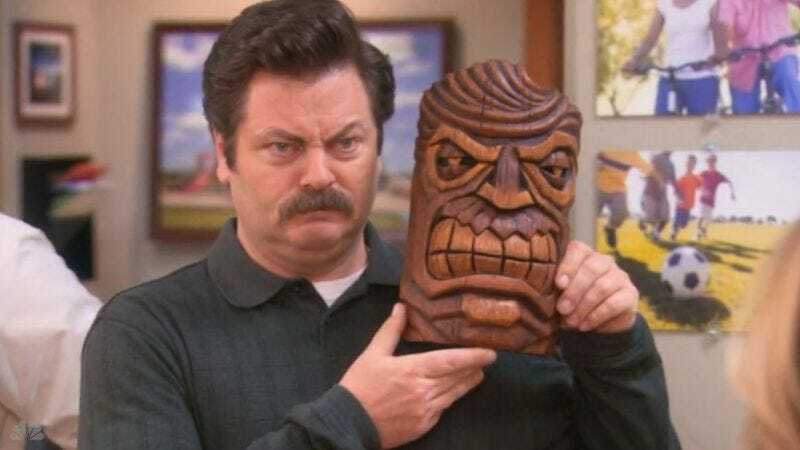 According to Screen Crush, the volume of assumptions about the Parks And Recreation director’s political leanings has reached a critical mass, and Nick Offerman felt duty-bound to weigh in on behalf of the city employee he portrayed on television. While Offerman offers a full-throated refutation of the Republican candidate on behalf of Swanson, he also explains that the stoically masculine bureaucrat “would not like Hillary either.” In fact, the actor explains that his Parks And Recreation counterpart would likely write in “Merle Haggard or Willie Nelson,” two individuals who, by the very nature of this campaign, legitimately resonate as preferable options, despite the fact that one of them is no longer living. So as we collectively while away the remaining weeks of this dumpster fire of a presidential campaign, The A.V. Club recommends surrendering the voting allegiances of fictional characters to the social media pundits who feel compelled to lay claim to them. After all, if somebody is rigorously constructing arguments as to why a particular candidate would be preferable to Khan Noonien Singh, Robocop, Tony The Tiger, or Barb from Stranger Things, perhaps this election isn’t as close as polling would suggest.